Built on the Android Things platform, the $199 Polk Assist smart speaker uses Google's learning algorithms and Android ecosystem for feature and security updates. Polk Audio is supporting its latest Polk Assistant speaker with a control app that is available on the Android and Apple iOS platforms. Bringing 45 years of audio engineering to the smart-speaker category, the new $199 Polk Assist employs Google technologies to deliver a high performing voice interface to the consumer audio market. Polk says the voice-controlled smart speaker provides homeowners a hands-free device usable around the home to perform a variety of tasks. "Polk Audio is committed to providing premium audio solutions enabled by the Google Assistant and Chromecast. 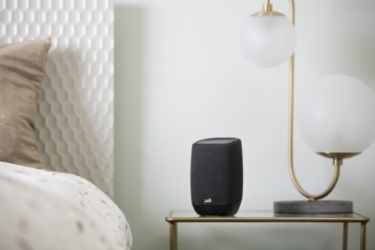 With the addition of the Polk Assist smart speaker, consumers can easily add Google Assistant's hands-free convenience and Chromecast's hi-res multiroom audio streaming to their homes," says Michael Greco, global brand director, Polk Audio. "Polk Assist complements and works with our existing Chromecast-enabled soundbars, including MagniFi Mini and MagniFi Max." Through the inclusion of Chromecast, Polk's Assist speaker can be used as part of a Polk Audio-based whole-house audio system for the playback of content from streaming services such as TuneIn, Google Play Music, iHeartRadio, NPR, and Spotify. Built on the Android Things platform, the new Polk smart speaker leverages Google's intelligent learning algorithms and Android development (and partner ecosystem) to enhance the speaker's user experience. According to the company, the Assist is also one of the first smart speakers built using certified Android Things System-on-Modules (SoMs), which receive regular feature and security updates from Google. Polk says the speaker will fit almost anywhere in consumers' homes due to its small footprint. It offers the Assist in a choice of midnight black and cool gray finishes.